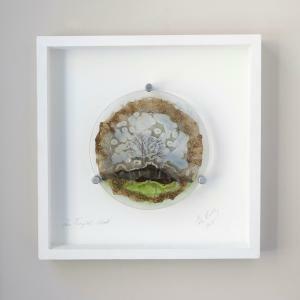 Intricate layers of fused glass beautifully depict a wooden Irish landscape. We thought you would like to know has been eyeing up our The Tangled Wood for some time now and has requested we bring it your attention. What's your question about The Tangled Wood? Eva Kelly’s ability to capture the fine detail of the Irish landscape in her fused pieces is second to none. Her framed piece ‘The Tangled Wood’ is no exception. The overall image is instantly recognizable and invites closer inspection of the intricate layered details that make up this stunning framed piece. 17" x 17" x 2.5"